I first started swimming at Portland aged 10 whilst looking for a sport that I would enjoy. After only a short period of time, I began to really enjoy being a part of the Club and thus have been an active member ever since, representing the Club at numerous galas. I started coaching in order to achieve my bronze Duke of Edinburgh award in 2013 as an assistant coach, yet liked it so much that I continued to help on poolside after the completion of my DofE award. In December of 2015, my passion and enjoyment of coaching led me to complete the ASA Level 1 course allowing me to become an official coach for the Club. 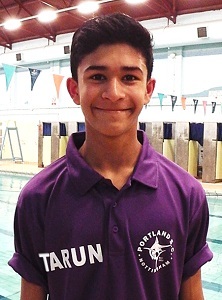 I have really enjoyed my time at Portland, as both a swimmer and a coach, and look forward to helping enthuse and develop the next generation of swimmers and hence help the club to grow and flourish.